The U.S. Navy’s lead ship in a new class of guided-missile destroyers, the San Diego-based USS Zumwalt, arrived in Ketchikan, Alaska March 23. During the port visit, Carlson will meet with city of Ketchikan Mayor Lew Williams III, Ketchikan Gateway Borough Mayor David Landis and Native Alaskan tribal communities. 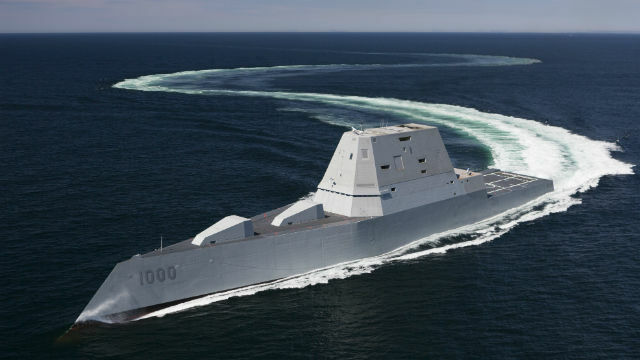 The crew will visit the Alaskan port and the Zumwalt will be used to showcase the U.S. Navy’s newest class of guided-missile destroyers. The Zumwalt stop in Ketchikan comes after a visit to the Naval Surface Warfare Center, Caderock Division’s Southeast Alaska Acoustic Measurement Facility. SEAFAC is part of the NSWC network that provides engineering expertise and technical assessment for the Navy’s operational units. “The facilities and technical expertise of the SEAFAC and Naval Surface Warfare Center personnel are critical components for the continued maturation and ultimately the delivery of Zumwalt capabilities to the fleet commander,” said Carlson. Zumwalt is operated as part of the U.S. Third Fleet, which leads naval forces in the Pacific and provides the realistic, relevant training necessary for an effective global Navy. Third Fleet works with the U.S. Seventh Fleet to plan and execute missions based on their complementary strengths to promote ongoing peace, security, and stability in the Pacific theater of operations.